A thread for precious metals. Whether you're buying physical or not. Let's discuss. Please let's not turn this thread into a discussion about the pros and cons of buying precious metals. Instead, let's focus on what moves we're doing and why. My last entry was at $34 on silver. It felt awkward to buy it. I'm now waiting for a dip on the daily to buy more before it hits $50. suggest you check out the thread under "Commodities"
Cotton is a commodity and so is sugar and oil. Except that I don't trade them. But I do trade gold and silver hence why I created a thread dedicated to this topic. Big doji candel on important psychologicly level. Sell? Could we expect another leg up around 34 level ? Other than me, is anybody using the Gold Silver Ratio as a short-term (M15,H1) signal generator? Green circle - tp , red - sl . Consolidating - sl/tp . I opened Long on XAUUSD, working through Heikin-Ashi charts. More details inside charts below. Comments and suggestions are welcome! Trying to wake up a thread that interests me. Silver prices continued trading between the ascending trend channel on H4 chart with top being 21.20 and bottom being 20.880. Silver has dropped from the sub-levels $16.00 earlier as expected. Intraday rallies are now to remain capped well below the $16.10 levels, which is interim resistance. As shown here, the metal might be unfolding a correction (3 waves), which could end around the $15.00 levels. It is hence recommended to remain flat for now and wait for a correction lower to initiate fresh long positions. Immediate support is seen at the $15.40 levels, followed by $15.00 levels, $14.40 and lower, while resistance is seen at the $16.10 levels (interim), followed by $16.50 and higher. Remain flat for now OR short with stop at $16.50, target is $15.30. Gold dropped lower to the $1,160.00 levels last Friday producing a bearish engulfing candlestick pattern and thus indicating further downside. The metal is pulling back for now, but intraday rallies should be capped below the $1,180.00 levels for now. 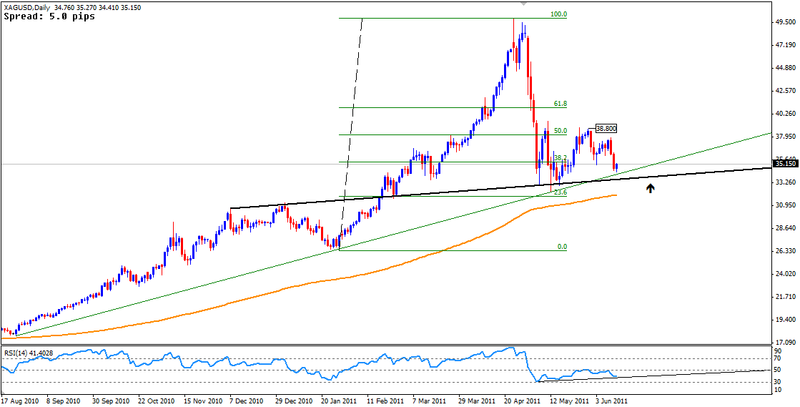 It is recommended to remain flat for now and initiate long positions on a drop at the $1,137.00 levels. Immediate support is seen at the $1,150.00 levels, followed by $1,140.00, $1,100.00 and lower, while resistance is seen at the $1,180.00 levels, followed by $1,190.00 and higher.